The Democrat National Committee can FINALLY have a Congressional Special Election Victory Celebration, a week from today, as either Assemblyman Jimmy Gomez or Robert Lee Ahn will become an obscure Rookie Congressman replacing, NOW California Attorney General Xavier Becerra. ** Blogger's Notes: Happy start of Bloggin Summer 2017 as a certain "California 51rd Assembly District Officeholder (via Riverside, now Eagle Rock)" preps for a LIKELY, long "Washington D.C. Vacation" by becoming the Congressional Replacement for, NOW Attorney General Xavier Becerra. Unless Runoff Challenger Attorney Robert Lee Ahn can make inroads into the East Bank of the LA River Voter Base of Assemblyman Gomez (and its actively attempting to do just that), many of the supposed "Progressive Endorsees" of the "Runoff Gomez Campaign" .........., will become potential candidates in a looming 51rd AD Special Election. If Gomez is successful next Tuesday, the hot Political Chisme has him supporting former CD-1 City Councilman Ed Reyes as his replacement, but not without a challenger (or more likely challengers), with East Area Progressive Democrats Co-founder (and previously unsuccessful 51rd AD Candidate) Luis Lopez, declaring his intentions (again) to seek a potentially vacated Assembly Seat, pending next Tuesday's results. A certain CD-14 City Councilman engaging in "Death Blame Game Politics". 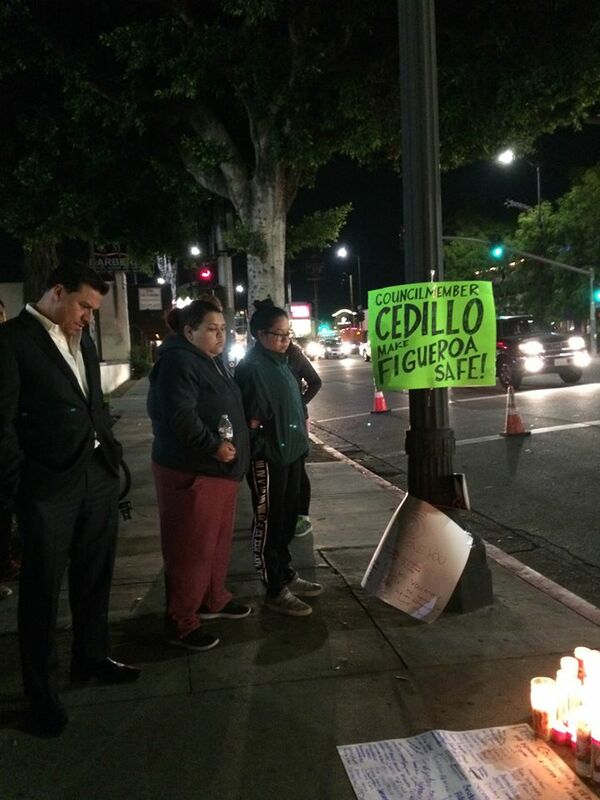 ** Political Peace between CD-1 City Councilman Gil Cedillo and CD-14 City Councilman Jose Huizar? NAUGHT!! Considering last week's City Council Vote to support terminating all funding for any variant of a completed 710 Freeway. Cedillo was in the definate minority (with the City of Alhambra) regarding his unpopular stance on the, NOW defunct 710 Tunnel Proposal ........., and his opposition did nothing to help foster PEACE with his Princeton Graduate Colleague. It should be noted that during the recent CD-1 City Council Campaign, the notorious, GRUDGE-holding CD-14 Officeholder, was SILENCE, while the majority of his City Council Colleagues condemned the Controversial Cyber Comments of unsuccessful CD-1 City Council Candidate Joe Bray-Ali. The Mayor Sam Blog had been made aware of specualtion that a POLITICAL PEACE TREATY was being brokered between the bordering Officeholders, but in the aftermath of the IMPLOSION via the Huizar-supported Bray-Ali Campaign and with the DEFIANT stance taken by Councilman Cedillo on the 710 Tunnel ........., the GRUDGE MATCH goes on----Scott Johnson. An universal condemnation of University of Southern California (USC) Vice-President (and former State Senator) Martha Escutia's Scandalous Conduct via her VULGER INSULT of President Donald Trump, is growing as President Max Nikias faces a communal ........, and potentially fiscal backlash. USC Max Nikias and the Board of Trustees have an Image Crisis, again. ** Blogger's Notes: University of Southern California (USC) President Max Nikias is facing a growing universal condemnation of his/school's Vice-President for Government Relations (and former State Senator) Martha Escutia's SCANDALOUS CONDUCT at last weekend's California Democrat Party (CADEM) Convention in Sacramento (view photos of V.P. Escutia below). V.P. 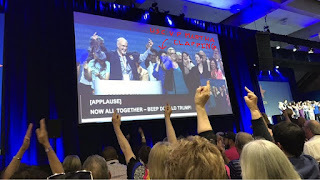 Escutia can be seen joining out-going CADEM Party Chairperson John Burton in a "F-Trump Chant (with Middle Finger Salute)". Multiple sources are commenting that the absence of condemnation of V.P. Escutia actions by the USC Administration, is an example of hypocrisy, in comparison to the ramifications (and firing of ) fprmer USC Football Coach Steve Sarkisian,in part for his INFAMOUS behavior at a "Salute to Troy Event". Further, community activists are also taking note of V.P. 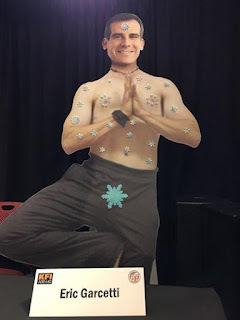 Escutia's silence regarding the Racist Insult ("Go back to India") directed at unsuccessful (and later controversial) CD-1 City Council Candidate Joe Bray-Ali, at a contentious Pico Union Candidate Forum, which she attended. President Nikias CONTINUING absence in not formally responding to the recent behavior of V.P. Escutia (and her underlings, including David Galaviz and Zul Surani), does not bid well for an University (embroiled in Scandalous Conduct), future communal relations----Scott Johnson. 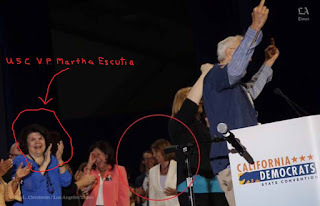 USC Vice-President (and former State Senator) Martha Escutia's Obscene Disrespect of President Donald Trump at last weekend's California Democrat Party Convention. Former USC Football Coach Steve Sarkisian's INFAMOUS conduct at "Salute to Troy Event". Out-going California Democrat Party Chairperson John Burton leading a vulger, "F-Trump (with Midddle Finger) Chant". Who is engaging in a Vulger Insult of the President of the United States? No one should be laughing or clapping regarding the repugnant behavior of California Democrats. The Institutional Culture of the, NOW "University of Scandalous Conduct (aka. USC)" continuous its devolution as Class, Loyalty and Respect for Rules, becomes the exception under the Leadership of President Max Nikias. 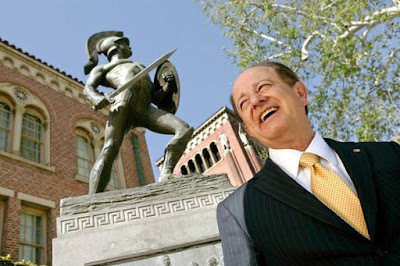 USC President Max Nikias overseeing his Administration's "Initiatives of Conquest", in pursuing its communal agendas. ** Blogger's Notes: It readily apparent in reviewing recent news items involving the "University of Scandalous Conduct's (aka. USC)" regarding actions of its Administration, communal allies, along with a certain "Former Politico, NOW USC Vice-President" at this past weekend's Democrat State Convention .........., that Loyalty, Respect for Rules and CLASS, are now the EXCEPTION under the supposed leadership of President Max Nikias, as we note below----Scott Johnson. Can you FIND the current USC Vice-President, formerly known as Democratic State Senator Martha Escutia, who is clapping and laughing as out-going California Democratic Party Chairperson leads a "F$%# Trump Chant"? 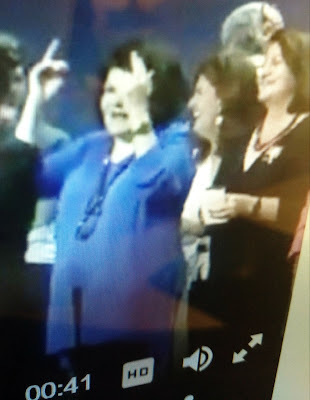 CLASS: President Nikias, Board of Trustee and ESPECIALLY current/future Republican Donors should take serious notice of USC Vice-President for Government Relations Martha Escutia's actions at this past weekend's California Democrat Convention. 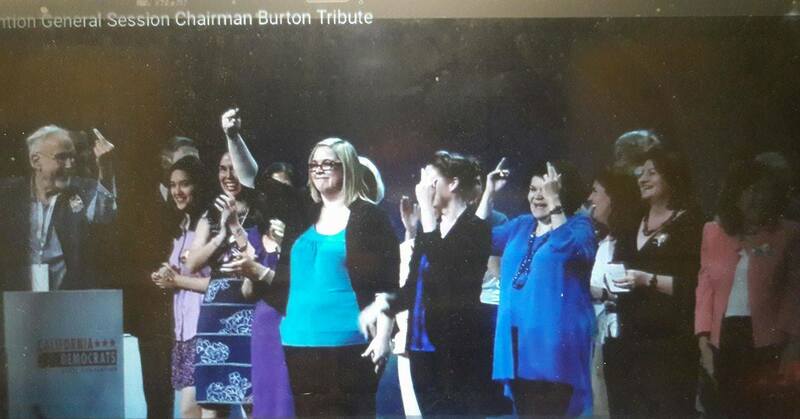 The former State Senator can be CLEARLY seen laughing and clapping (with LA County Supervisor Hilda Solis and Congresswoman Nancy Pelosi), as out-going State Democrat Party Chairperson John Burton led a "F$%# Trump Chant (with a One Finger Salute)". Many discerning news observers will remember a certain "Ex. Football Coach" who embarrass the University with his drunken conduct ..........., and likewise, the President Donald Trump Administration, along with the Republican-controlled Congress and Senate, are likely ............, NOT to forget V.P. Escutia's actions when USC seeks future Federal Funding. 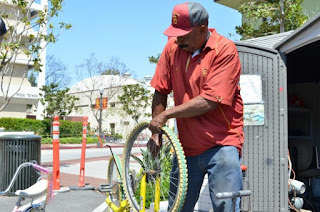 "Lil Bill" Flournoy reamins loyal to the USC Cycling Community .........., while the "University of Scandalous Conduct" shames itself with its apparent accomonidations (to family members) of the Political Establishment. LOYALTY: Community Activists (along with thousands of petition signers) have/are taking NOTICE of the "University of Scandalous Conduct's" treatment, more like Act of Disloyal targeting the Flournoy Family-owned "Bill's Bike Shop". The abhorrant treatment of the 40 years plus, business endeavor of Father Bill and Son Arron (aka. Lil Bill") is a MAJOR CAUSE for interest when reviewing the "considerations granted" to those currently employed by the University. 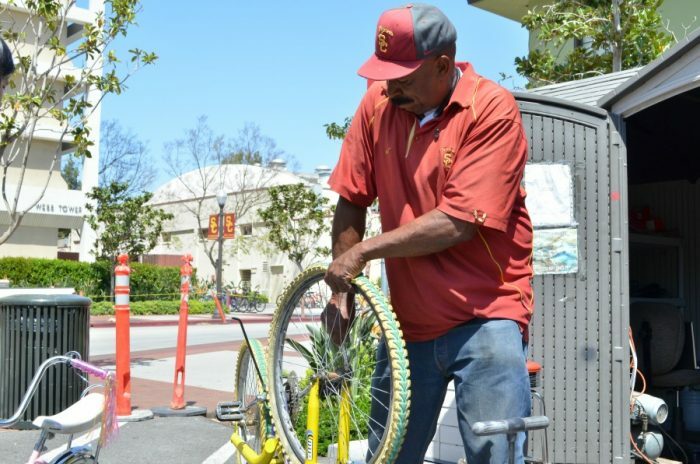 The "Community Ombudsman" for the University Village Project which is responsible for the UPROOTING/EXPULSION of Bill's Bike Shop .........., is STEVE (younger Brother of Herb) WESSON, who was allegedly under-qualified for the Six-figures Salary Position. 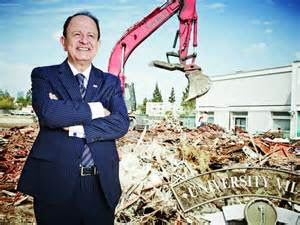 Its apparent, again that the USC Administration under President Nikias, is more accomindating to the local Political Establishment (and its needy family members) than a small, Father and Son Business, with decades of service to its University Community. Lincoln Heights Neighborhood Council Land Use & Development Committee Chairperson Mario Marrufo, respects NO RULES in placing his Sister (and removing Board Members) on the Comm. under his charge. RESPECT FOR RULES (NAUGHT): The University of Scandalous Conduct is seeking support for a Corporate Welfare Scheme that would grant LA County-owned Properties (with LA County Board of Supervisor Hilda Solis support) for its ambitious Biotech Corridor Project ........., but not without concerns from the surrounding community. 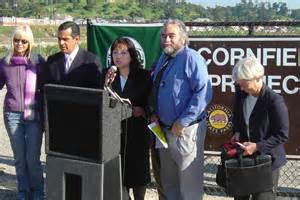 In response to those concerns, LA County Board of Supervisor Hilda Solis recommended hiring an Outreach Consultant to engage Stakeholders, That said, USC and its Communal Enablers are not waiting for feedback as they disregard Rules (and the Brown Act allegedly), in crafting Support Letters for the Project, as witnessed with the actions of the Lincoln Heights Neighborhood Council. We noted previously that the LHNC Land Use & Development Committee, Presided by Mario Marrufo, held a meeting that was allegedly, not in complience with the Brown Act, where support for the Brown Act Violation was approved. Yet, dispite of the legalities, the EXECUTIVE COMMITTEE, was the entity that placed the Approval of a Biotech Support Leader on the April LHNC Agenda. We should note that Marrufo had remove LHNC Board Members from the LU & D Committee ..............., and installed his SISTER, without Public Hearing. More later----Scott Johnson. A NEW Mayor Sam Bloggin Feature: "Ask a Fake News/Propagandist Muckraker ........., featuring Brian Hews"
As the Litigious Pushback against the alleged, Libelous Journalistic Malpractices via the Publisher/Editor Brian Hews of the Los Cerritos Newspaper (aka. 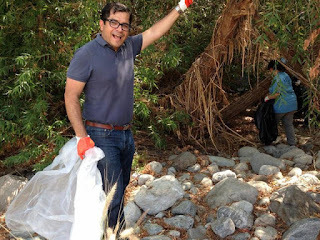 "The Brian Hews/Los Chacon News"), gains further credence, the Mayor Sam Blog introduces a new bloggin series bestowed as, "Ask a Chacon Political Family Fake News/Propagandist Muckraker (for Hire, allegedly) ......., featuring Brian Hews". The Creator/Purveyor of Political Alternative Facts ........., benefiting the infamous Southeast LA Chacon Political Family. ** Blogger's Notes: For our critics (real, or trolling creations of the Political Establishment), who allege (MOSTLY, with false premises) that we engage in constant negative, contrived narratives, regarding the bloggin topic/subject of choice .........., then you are not familiar with the "REIGNING PURVEYOR of CONTRIVED JOURNALISM/PROPAGANDA" Brian Hews (in Southeast LA County). For those outside the bloggin know, Hews is the Publisher/Editor of the Los Cerritos Community Newspaper (part of the Hews Media Group), a former Award-winning, Weekly of Record ............, now derisively referred to as the "Brian Hews/Los Chacon News". Once attributed (and lauded) for being the supposed, "Source of Record", in exposing the Former (and Indicted) LA County Assessor John Noguez Scandal, the current weekly source of Kitty Box Liner, has devolved into a Propaganda Dispenser/Tool, promoting the interests of the infamous Commerce/Montebello Chacon Political Family, via factually-challenged missives, targeting political opponents ......., with NOW litigious ramifications. In late April, Central Basin Water District Director Leticia Vasquez, took the first legal swing, aimed at the Hews (and Chacon) Propaganda Pinata, via her Libel Lawsuit, "in response to an article it published in June 2016 that accused her and a Montebello councilwoman (Vanessa Delgado) of attempting to extort campaign contributions from a housing developer". Since the lawsuit announcement, Hews has been ceaseless in continuing to keyboard attacks on those REPORTING THE FACTS on his actions, including Whittier Daily News Reporter Mike Sprague, (who has been targeted repeatedly in the past), and was smeared again, via a "Staff Report". We should also note that this blogger has been on the receiving end of a "Brian Baseless Tantrum (BBT)" that included some explicit language, prompting a bloggin response that DISCLOSED a public monetary linkage between "The Brian Hews/Los Chacon News" and Montebello Unified School District. Thus, since Hews seems MANIC (using multiple personas) in continuing his brand of "Contrived Journalism/Propaganda", we are today introducing a NEW, regular bloggin feature bestowed as ........, "Ask a Fake News/Propagandist Muckraker .........., featuring Brian Hews". As the title implies, our cyber audience can submit questions (by email redspotincd14@yahoo.com), regarding latest Fake News/Smears via "The Brian Hews/Los Chacon News" and hopefully, we can post a response, through channeling the multiple personas of Brian (allegedly). An excerpt below. Question: Dear "Ask a Fake News/Propagandist Muckraker Brian (allegedly)", Is it true that "The Brian Hews/Los Chacon News" IGNORED THE FACT that current 2017 City of Commerce City Council Candidate Jaime Valencia's "Signature Gatherer (aka. Lynwood's Sylvia Ortiz)" from his (and Mike Alvarado's) failed 2014 Recall Attempt ........., was the 2015 Manager of Fernando (brother of Art, Hector ....... and Jaime's political ally Hugo Argumedo) Chacon's Montebello City Council Campaign? Reply: Who gives a F%$# about an alleged 460 Form!!!!. 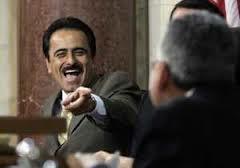 Jaime can do NO WRONG as a willing enabler of the Chacon Political Machine. 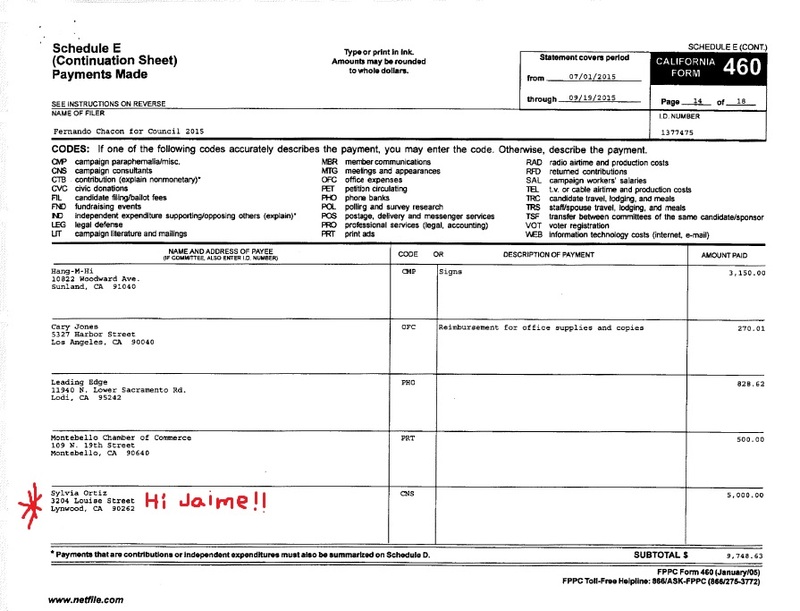 460 Form via the 2015 Fernando Chacon for Montebello City Council Campaign ......., denoting $5,000 Payment to CURRENT Commerce City Council Candidate Jaime Valencia's former RECALL Signature Gatherer Sylvia Ortiz. More "Ask a Fake News/Propagandist Muckraker ........., featuring Brian Hews", in the days ahead. Tony Villargovea's President Trump Impeachment/Resignation Comments prompts "Failure Mayor Villar (then Raigosa) Scandalous Bloggin Flashbacks"
An Increasingly-irrelevant California Gubernatorial Candidate Antonio Villar (now Govea)'s comments regarding the need for President Donald Trump's Impeachment/Resignation, prompts numerous "Former Failure Mayor Antonio Villar (then Raigosa) Scandalous Bloggin Flashbacks". 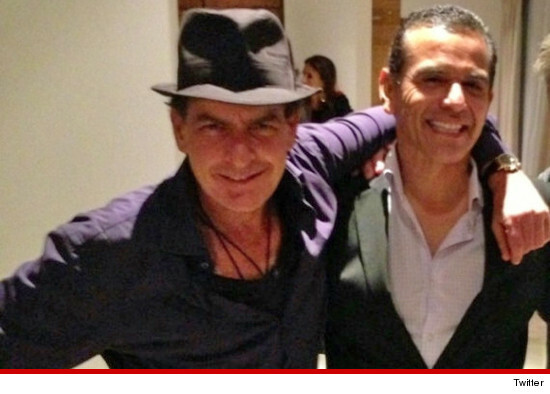 Are there MORE secrets to be found regarding "Tony y Charlie Cabo Misadventures", compare to President Trump's ALLEGED Russia Collusion? 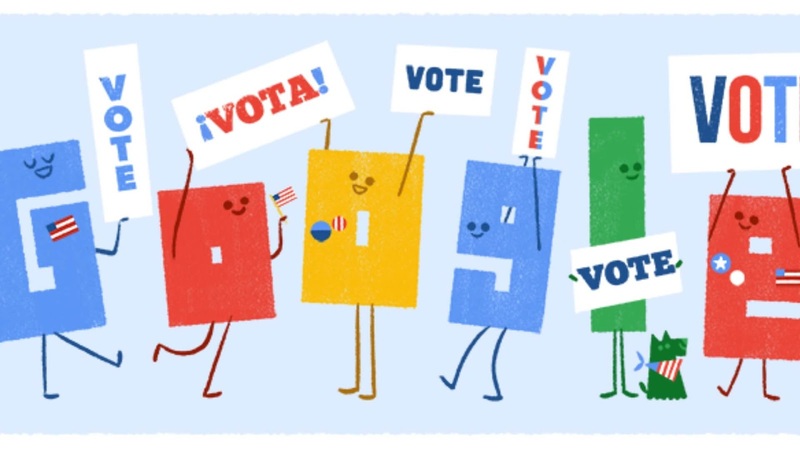 ** Blogger's Notes: With the 2017 Installment of the City of Los Angeles Municipal Elections, now another past affirmation of Establishment anointments, we can find cause to engage in an episode of Scandalous Bloggin Flashbacks, compliments via the recent AHHHHTTERANCES by California Gubernatorial Candidate Tony Villar (now Govea). 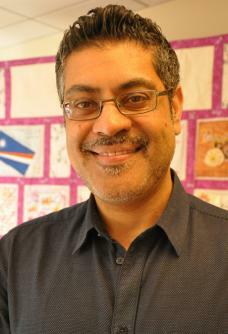 The comment, in lieu of this weekend's "Cubafornia on the Pacific" Democrat Party Convention, can easily be discerned as an "Exercise in Pandering" to the rabid, "Ruskie Collusion Truthers (as personified by Congresswoman Maxine Waters)" of the "Cubafornia on the Pacific's Ruling Political Party", which is one of Tony V's best political traits ......, especially when seeking to reincarnate his Political Identity. Former President Barack "Hussein/Hypocrite" Obama's INFAMOUS Flexible Comment to Russian President. That stated, we CANNOT help to chuckle that a FOUR TIME BAR EXAM FAILURE via the People's School of Law, would be sought out for attribution by the Sacramento Bee regarding whether the alleged acts of (and STILL unsubstantiated) Obstruction of Justice by President Trump, merits Articles of Impeachment. but lets not forget the City Terrace Native was once referred to as the "Latino Tony Blair", early on in his choreographed, "Pop Star Mayoral Administration (before Mirthala)". 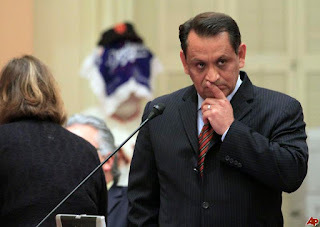 But what many longtime, OBJECTIVE "Tony/Antonio Villar-(then Raigosa, now Govea)" observers will not forget, are the multitudes of Scandals that could not be whitewashed by the formerly, "LA ANTONIO TIMES", thanks in parts to substanced reporting in the LA Weekly (11% Mayor by Patrick Range McDonald), LA Daily News (the TRUE Tony Villar Exclusives by Tony Castro) and culminating in the "Failure Mayor Classic Cover Story in Los Angeles Magazine. It ironic that the Gubrnatorial Candidate Villar (now Govea) would readily accept being attributed further, in supporting an Independent Prosecutor, when he was the RECIPIENT of Mega Contributions from the likes of former Downtown Developer Richard Meruelo and Renewable Energy's Ari Swiller, who's land purchese schemes merit revisting. The BASICS via the Daily News, regarding Meruelo's 2006 Taylor Yard Eminent Domain Payout by LAUSD. Here are the basic facts: The LAUSD wanted the 23-acre property along the banks of the Los Angeles River for a new high school in the Eastside neighborhood. But the district was edged out by prominent downtown L.A. developer Richard Meruelo, the No. 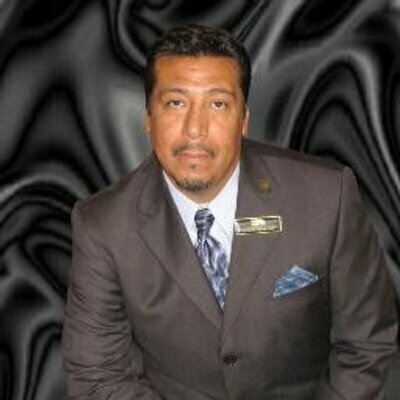 1 contributor to Mayor Antonio Villaraigosa's political campaign. Meruelo came out of nowhere to scoop up the property rights when school officials say they were getting ready to buy it. Now the LAUSD is looking at seizing the land through eminent domain, paying a fair-market value ....... which ended up costing $50 MILLION DOLLARS. Eerily familiar was Ari Swiller's Renewable Resources purchase of the Onyx Ranch in Kern County, a property coveted by the DWP, as the LA Times reported. A business venture led by a friend and advisor to Los Angeles Mayor Antonio Villaraigosa outmaneuvered the city last year to buy land in Kern County that the Department of Water and Power wanted for a wind farm. 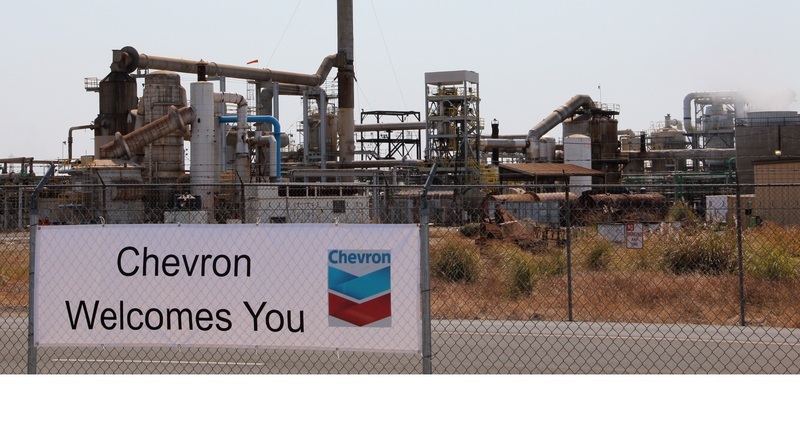 In the case of Onyx Ranch, the venture headed by Swiller beat the DWP to the land, bought it for $48 million and, before the transaction was completed, offered to sell less than half of it to the utility for $65 million ........, which fell through. 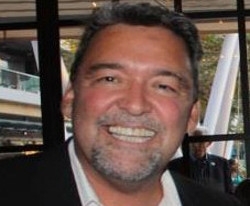 Unlike the President Trump allegations, which are a byproduct of a Wife of Bill Clinton Campaign-colluding Main Stream Media's "Exercise in Attributing Anonymous Resources via ILLEGAL INTELLIGENCE outing of American Citizens, (allegedly)", the past links of, NOW FAILURE MAYOR Antonio Villar-(then Raigosa) to Mega Donors attempting to profit from alleged, INSIDER INFORMATION on desired Property Aquisitions, were/are more worthy of a Federal Grand Jury Investigation .........., and MERIT revisiting by "Cubafornia on the Pacific Voters" in 2018----Scott Johnson. On this morning after the 2017 May Runoff Elections, Charter School Advocates are the BIG WINNERS as their new, allied LAUSD School Board Majority, NOW includes newcomers Nick Melvion and Kelly Fitzpatrick-Gonez. In addition, CD-1 Councilman Gil Cedillo won Re-election by a BIG margin and the Ethically-challenged Monica Rodriguez narrowly defeated Karo Torossian in CD-7. 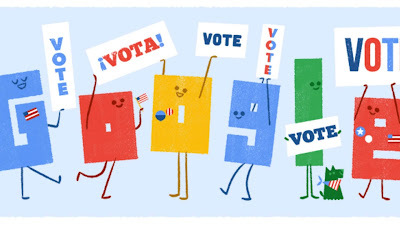 ** Click here for Election Results. 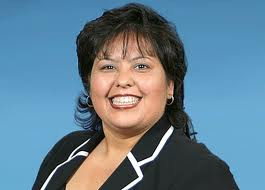 Will the LAUSD School Board feature a Second Incarnation of "President Monica Gorda Boo Boo Garcia"? With the Imploding Joe Bray-Ali Campaign vanquished, the NOW Second Term CD-1 City Councilman (and friend) can enjoy some Quality Time, as pictured below. Despite MEGA Establishment Support and multiple, alleged Ethics Violations, "Team Lady M Rod" inherits a DIVIDED CD-7 Council District. An Election Day Coverage Update. Please pardon our bloggin pause as we rehab a BADLY sprain right wrist, we will hopefully post CD-1, CD-7 and results from the MOST EXPENSIVE LAUSD School Board Elections ever later tonight. Until then ............, remember TO VOTE. ** A Gonez Victory flips LAUSD School Board to Pro Charter. ** Zimmer has conceded via the LA Times. ** Lady M Rod BEHIND on the Absentees. ** Cedillo benefits from Joe Bray-Ali Campaign Implosion. With less than 48 hours remaining before the CD-7 Runoff Election Day, the "MENTIROSA Monica Rodriguez Campaign" goes DESPERATE (with VERY possible legal ramifications), as it attempts to compare Challenger Karo Torossian to former "Indicted, Convicted (Ooops!! Overturned on Appeal) CD 7/2 City Councilman Richard AlarCON". Former CD-7 City Councilman Richard Alarcon must be STILL laughing after The MENTIROSA Monica Rodriguez Campaign FALSELY stated his (OVERTURNED) Conviction on a Campaign Mailer. ** Blogger's Notes: With less than 48 hours remain before Tuesday's CD-7 City Council Runoff Election, its READILY apparent that "The MENTIROSA (LIAR in Espanol) Monica Rodriguez Campaign" is DESPERATE. As the Daily News reports that an investigation has been requested by City Council President (and current CD-7 Administrator) Herb Wesson regarding the ILLEGAL removal of Challenger Karo Torossian Campaign Signs, the MENTIROSA Monica Campaign sent out a REPUGNANT ATTACK MAILER that insinuates Candidate Torossian exhibits the same "UNETHICAL TRAITS" that led to the former CD-7 City Coucilman Richard Alarcon's "Indictment and Conviction (allegedly)" on Residency Issues. But (and a BIG BUT it is), the MENTROSA Monica Campaign FAIL to note that AlarCON's Conviction was OVERTURNED on Appeal ......., which prompted the comment by the, NOW FORMERLY Indicted and Convicted CD-2/7 City Councilman Richard AlarCON below. In retrospect, a past ethically-challeged POLITICAL MENTIROSA (in 2007), is now a DESPERATE POLITICAL MENTIROSA (in 2017)----Scott Johnson. Chevron (again) Presents .........., "The BIG OIL MONICA Robo Call Festival"
On this GOTV Weekend before Tuesday's May 16 CD-7 City Council Runoff Election, the Mayor Sam Blog PROUDLY presents ........., "The BIG OIL MONICA RoboCall Festival", with Special Apperances by Congressman Tony Cardenas, Secretary of State Alex Padilla and Rookie Assemblyman (again) Raul Bocanegra ......., PAID FOR by Chevron. Will "BIG OIL MONICA" finally EMBRACE her inner-Political Hypocrisy? ** Blogger's Notes: As the GOTV Weekend bofore the Tuesday, May 16 CD-7 Runoff Election commences, the Mayor Sam Blog, with sponsership from CHEVRON presents ........, "The BIG OIL MONICA RoboCall Festival" as the City Hall Establishment, along with the Northeast San Fernando Valley Democratic Machine, seek to install the FRESH FACE of Monica Rodriguez, as its anointed replacement for FU Felipe Fuentes. We are please to announce (or warn CD-7 Households) of PAID FOR Special Appearances by "The Three Male Feigner Politicos of the NSFV" which are Congressman Tony Cardenas, Secretary of State Alex Padilla and ROOKIE (again) Assemblyman Raul Bocanegra-----Scott Johnson. A Mayor Sam Exclusive Update!! 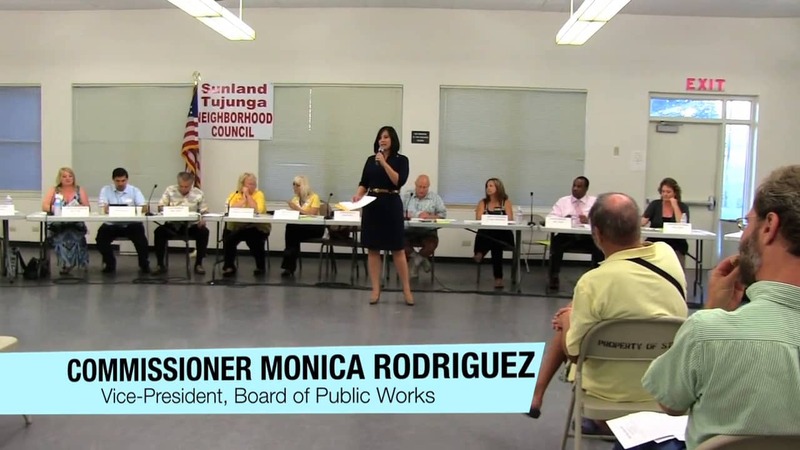 "A PAY to Have Monica RETALIATE Against the Sunland Tujunga Neighborhood Council Scandal Brewing"? In a Mayor Sam Exclusive Update, we note the RESPONSES from CD-7 City Council Candidate Monica Rodriguez supporters, which lends credence to "A PAY to Have Monica RETALIATE Against the Sunland Tujunga Neighborhood Council Scandal", targeting the NC's Land Use & Development Committee's Oversight on Illegal Signage Issues. Former Board of Public Works Vice-Prssident (and current CD-7 City Council Candidate) Monica Rodriguez addressing the alleged "RATS (in the words of some of her campaign donors)" of the STNC. ** Blogger's Notes: In a Mayor Sam Exclusive Update, comments from supporters of Monica Rodriguez are lending credance to the fact that, THEN Board of Public Works Vice-President's INTERVENTION on behalf of some within the Sunland Tujunga Chamber of Commerce, was more about RETALIATING against Stakeholders (including STNC and Committee Members) ........., then finding a communal solution to Illegal Signage Issues. FOR THE RECORD, Stakeholders have a RIGHT to file complaints with the appropriate City Department regarding Illegal Signage .........., and have their idenity remain confidential. Judging from the comments below, mixed with the FACTS from the emails disclosed in our Exclusive, ethical observers (and CD-7 voters) would be in their right to request an investigation regarding whether the, NOW CD-7 City Council Candidate, abused her PAID City Office to RETALIATE against the actions of the STNC ..............., in return for Campaign Contributions (listed below)-----Scott Johnson. "Frank, would you kindly have staff coordinate with Michael ( of the S.T. Chamber of Commerce). Long story. Cindy is not the appropriate point person and it is complicating matters significantly". Mayor Sam Exclusive: "Lady M Rod's Political Ambition of Lies, Misinformation and Misuse of Public Resources Exposed (Again)"
In a Mayor Sam Exclusive, we DOCUMENT again how the POLITICAL AMBITION (mixed with lies, disinformation and misuse of public resources) via CD-7 City Council Candidate Monica Rodriguez, WRONGFULLY besmirched the selfless-character of award-winning Sunland-Tujunga Community (and city-wide Neighborhood Council) Activist Cindy Cleghorn. 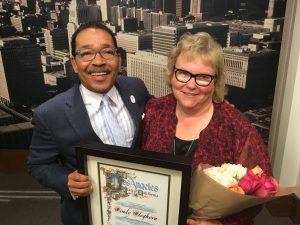 LA City Council President (and CD-7 Administrator) Herb Wesson, with 2017 Council District's "Pioneer Woman of the Year" Cindy Cleghorn. ** Blogger's Notes: Its a major UNDERSTATEMENT to keyboard that the every community/neighborhood needs a SELFLESS leader, as exampled by longtime Sunland-Tujunga Community Activist Cindy Cleghorn. 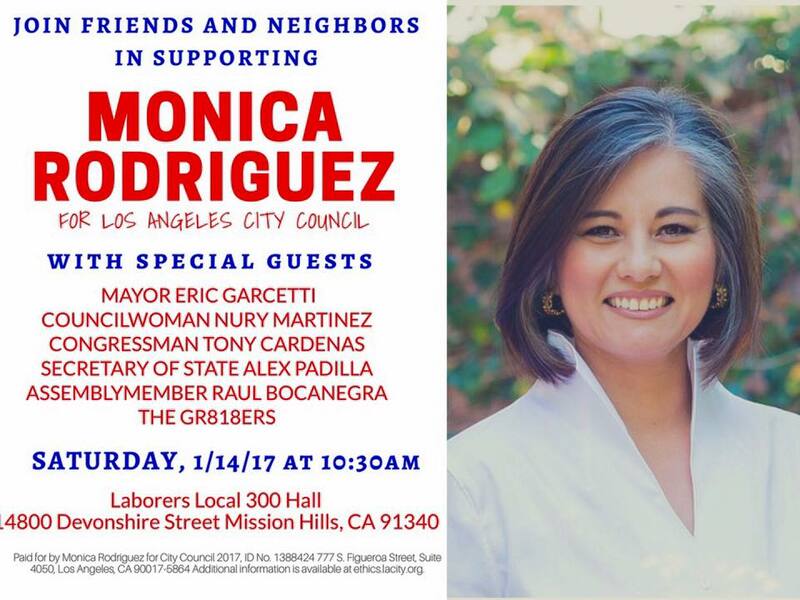 Mayor Sam Exclusive: ANOTHER Ethics/Measure H Violation via the Monica Rodriguez for CD-7 Campaign? In a Mayor Sam Exclusive, we disclose ANOTHER, alleged Ethics Commission/Measure H Charter Amendment Violation via the Monica Rodriguez for City Council Campaign, that HIGHLIGHTS, again the "Fresh Face" of the Northeast San Fernando Valley Democratic Machine's disdain for the RULES governing Open and Transparent Campaigning. Is "Lady M Rod" giving False Witness (again) to her increasingly fraudulent CD-7 Runoff Campaign? 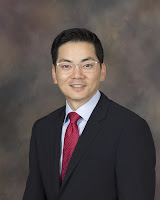 ** Blogger's Notes: In a Mayor Sam Exclusive, we present yet ANOTHER, alleged Ethics Commission/Measure H Charter Reform Violation via the Monica Rodriguez for CD-7 Runoff Campaign, that involves ILLEGAL CAMPAIGN CONTRIBUTIONS by a "Principal" of a Business with a JUST-RENEWED City Contract. 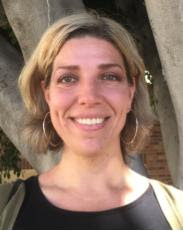 In June of 2016, former Board of Public Works Vice-President Monica Rodriguez voted to extend the Graffiti Removal Contract for the Sun Valley Chamber of Commerce (and its apparent Sub-contractor "Sun Valley Graffiti Busters"). In August, the, NOW Former Vice-President Rodriguez, became CD-7 City Council Candidate "Lady M-Rod" ........, and who was one of her first Campaign Donors? Sun Valley Graffiti Busters Program Manager/Founder/Executive Susan Bartlett .........., who may be a GREAT CANDIDATE for a future Ethics Commission Investigation, for VIOLATING the Measure H Charter Revisions----Scott Johnson. With a week remaining before the May CD-7 Runoff Election, the Monica Rodriguez Campaign is the FOCUS, again of unethical allegations as KCAL/KCBS's Investigative Reporter David Goldstein exposes a Taxpayers-financed Community Base Organization's (CBO) Illegal Removal of Challenger Karo Torossian Signage. Will "Lady M Rod" denounce the multiple acts of Illegal and Repugnant Behavior by Associates of her Campaign. 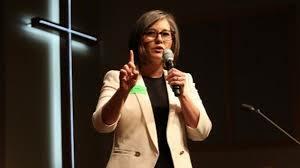 ** Blogger's Notes: With a week remaining before the May CD-7 Runoff Election, its READILY apparent that the Monica "Lady M Rod" Rodriguez Campaign (and supporters) are exhibiting complete DISDAIN for rules .........., and morals. From the alleged, ILLEGAL removal of Campaign Signage, as disclosed by KCAL/KCBS Investigative Reporter David Goldstein, to former Female CD-7 Candidates being the targets of misogynist comments, along with a supposed, temporary/neutral City Council President/Council District Administrator Herb Wesson, using a Townhall to promote his "Candidate of Choice" .........., the "Establishment" is using all it resources to insure that their "Fresh Face" gets elected----Scott Johnson. The Mayor Sam Blog GLADLY goes ON THE RECORD in repudiating the REGURGITATED (originating with Anti-Armenian, former Assemblyman Mike Gatto), conspiracy utterances by Board of Neighborhoods Commissioner (BONC) "LYING EVE" Sinclair, which FALSELY insinuated a financial relationship between Political Consultant Eric Hacopian and this Bloggin Entity. Board of Neighborhood Commissioner (when rarely Present) "Lying Eve" Sinclair. 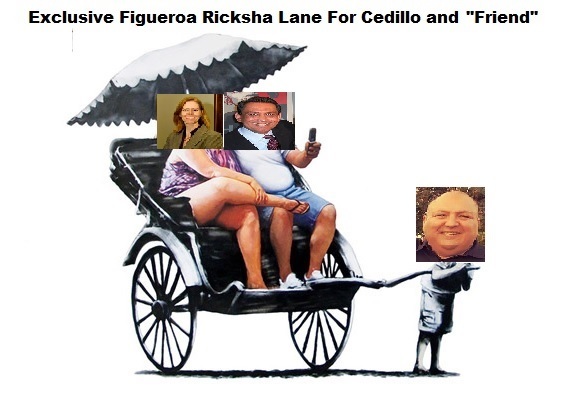 ** Blogger's Notes: How DESPERATE is the Fresh Face of the Northeast San Fernando Valley Democratic Machine Monica Rodriguez, in seeking to replace "FU Fuentes" as the CD-7 City Council Officeholder? Considering that the former San Fernando High School CLASSMATE of Late Mayor Sam Blog Founder Michael Higby, has remain SILENT while her Campaign Supporter BONC Commissioner "LYING EVE" Sinclair REGURGITATES, conspiracy utterances that originated from associates of DOCUMENTED, Armenian-American Voter Discriminator (and CURRENT Campaign Donor), former Assemblyman "Lil Mikey" Gatto ........, we DARE say that "Lady M-Rod" has become devoid of a CONSCIOUS. Will the "Higher Office Path of Least Resistance" of Los Angeles Mayor Eric Garcetti, lead to a 2020 Presidential Campaign as the New York Times reports that National Donors have broached the idea with Allies of the just Re-elected Mayor (who is STILL pondering a 2018 Gubernatorial Campaign). From the KFI John and Ken Show Mayoral Debate: How would the National Democratic Electorate receive a "Yoga Pants Garcetti for President Campaign"? ** With no apologies to former Failure Mayor Antonio Villar (now Govea), the New York Times is touting the CURRENT Third Floor Officeholder at 200 Spring Street, as a possible 2020 Presidential Candidate (cough, cough). The thought of a possible "Yoga Pants for President 2020" has motivated us to channel the former Assemblyman Mike Gatto, who sought to find a lucrative return on registering Domain Names, as exampled by "RightTarded.com", "LeftTarded.com" and the CLASSIC "DealonDrugs.com" ........., in crafting our creative terms listed below. ** As the News Media reports on the latest large OVERTIME Payouts to Los Angeles Fire Department Fire Fighters, absent is any reporting on an alleged "Bonus for No Overtime Authorization Scheme" between LAPD Chief Charlie Beck and Divisional Patrol Captains ..........., including NEW Hollenbeck Division Captain III Ruby Flores (formerly Malachi). 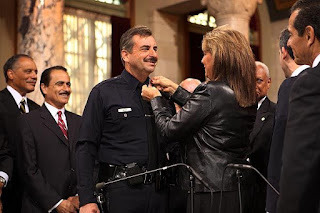 How much will Chief Charlie Beck (with Wife above) enrich alleged, CLOSE FRIEND, Captain Ruby Flores (formerly Malachi) for cutting OVERTIME allocations to Patrol Officers at Hollenbeck? ** The Mayor Sam Blog has learned that serious Legally-questionable Actions/Brown Act Violations may have taken place during the April 20, 2017 Lincoln Heights Neighborhood Council General Board Meeting regarding a Letter of Support for the University of Southern California's QUEST to have LA County Land granted for its Biotech Corridor Proposal. More information later in an EXCLUSIVE Post. Was USC (and Lincoln Heights NC Member) Zul Zurani a willing ENABLER to a Brown Act Violation that benefited his employee?